Get the most out of your time in Venice with a sunset boat and walking private tour showcasing the highlights this city has to offer on both land and sea. Our Venetian guide will first bring you through the 'must-see' hot-spots on land, finishing with a private boat ride taking you down one of the most famous canals in the world; the Grand Canal. Meeting Point : St. Marks Square, full details will be sent in the confirmation email. Venice is one of the most unique cities in the world, the city built on water, so unique in fact, it has been named as a World Heritage Site to protect this rare beauty. This is a great private tour for travelers wishing to see Venice from two aspects, land and sea. The time for this tour is split between walking through the narrow streets and sailing through the canals on your very own private boat, getting the opportunity to see all the best bits. Your tour will begin in the world's most famous squares, you've guessed it, St. Mark's Square, where your guide will explain all the historical sites which surround this magical square. They will explain, from outside, the glory and fall of the Doge's Palace, where once the government sat, St. Mark's church and the Bridge of Sighs. From here, you will move through the 'car-less' streets, offering you a true taste of Venice's inner beauty without the noise of traffic on the streets. As you make your way through the streets, you will get the opportunity to see the spot where Marco Polo used to live during his traveling and exploring days. Learn about his travels to the East on the 'Silk Road' and how he inspired Columbus to set sail for richer pastures. Then we move onto the Rialto area, known for it's markets and trade from hundreds of year's ago till the present day. It has given inspiration to many writers, most famously, William Shakespeare's 'Merchant of Venice'. 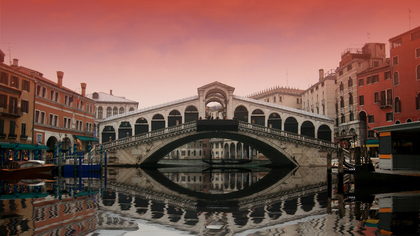 You will get to experience a true sense of Venetian living whilst visiting this area. The main lagoon is made up of 118 islands, all of which are connected with bridges to access the most beautiful historical sites. 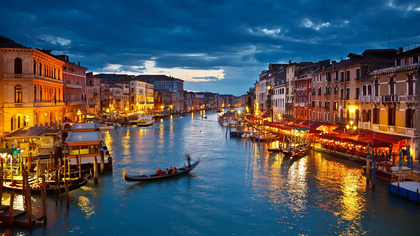 Venice is most famous for being 'The city built on water'. so what better way to see what it's famous for than on a boat. You will have access to your very own private boat that will take you down the iconic Grand Canal, which was used to carry goods in and out of the city. Sit back and relax as you watch the sun setting over the buildings and Palaces you have just visited on land. Your tour will finish back at St. Mark's Square where you can sit down and enjoy some delicious local cuisine at one of the many restaurants in the area. St. Mark's Church and The Doge's Palace is explained from outside not inside. This is due to the fact that it is an evening tour and these sites will be closed.